After nine days, way too many cab rides, and 40+ hours in the air, my long-anticipated Indonesian vacation is officially over and I’m back home in the concrete jungle. Frank Sinatra’s ‘New York, New York’ came blasting through the airplane speakers as we touched down at JFK airport yesterday, jolting me back to reality. Did that just happen? The previous week seemed like a dream—I couldn’t grasp that less than 24 hours before, I was stretched out on the sand of a Balinese beach. Truthfully, as I reflect on the past seven days, I’m finding that I’m at a loss for words. I’ve seen a lot of the world, but can say with confidence that if you travel to Bali, you won’t be quite the same person when you return. Unless you're totally devoid of emotion or empathy, something will shift in your core and you'll inevitably look at life through slightly different lenses. Sure, the eyegasms of the beaches, sunsets, forests, and mountains alone are worth the trip. But for me, what made Bali so unique was the people that I encountered. They resonated a type of peace that I envy. They were content and at ease with themselves—they were just extremely nice. 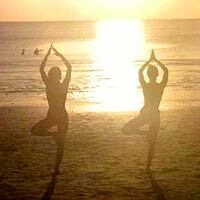 Before I arrived in Bali, I made a conscious decision to put my exercise routine on hold to fully immerse myself. I wanted to spend my time experiencing a new culture and environment, not stressing about fitting in a 5 miler or doing push-ups. I wanted to Zen out. My “workouts” in Bali consisted of yoga (done sporadically on the beach and during a few private group sessions), lots of walking, massages, lifting wine glasses, laughing, and a touch of “Bali Belly” (a common post-meal bout of tummy trouble that typically subsided after a few hours). Food wise, I ate mostly rice, seafood, chicken, fruit, and eggs—no cheese! I didn’t eliminate cheese by choice; dairy just didn’t have a presence in most of the meals that were prepared for us. But I did notice that, Bali Belly aside, my stomach seemed a tiny bit happier to be on a lactose-vacation. I rode elephants and fed monkeys in Ubod, marveled at rice fields in the mountains, and bathed in hot springs in Banjar, but one of my favorite moments was the private group yoga session that we had in the garden of our villa in Seminyak. Our instructor, Steve, was a tall New Zealander who could have been Kurt Russell’s twin. He had a fantastic accent and a great demeanor. Most importantly, he managed to keep our motley crew, made up of many yoga virgins, entertained for an hour, despite some language barriers (my traveling companions are French). He was such a hit that we immediately invited him back for another session several days later—our last day in Bali. And what better way to end a once-in-a-lifetime trip than by doing warrior poses in an Indonesian garden? Bali, you blew my mind. Thank you for your kindness, beauty, generosity, and spirit. I will be back.